Since I was served this Spanish version of an espresso milk based drink at Espresso Lab (Cape Town) in October 2009, it has become my favourite morning brew. In summary, it is half espresso and half milk/froth, almost like a smaller brother of a cappuccino but packs more punch because there’s more espresso in it, which means you get to taste the coffee more. So, to get a little technical, you’re looking at a 50-60ml double espresso extraction (depending on how many grammes you use) topped with about the same amount of liquid (frothed and steamed milk). It’s much easier if you have a 100-120 ml cup of course, but just play around with it, so that the coffee punches well through the milk. You should also be able to detect some different taste notes coming out such as milk chocolate and hazelnut, which appear to reveal themselves more distinctly when milk is added to the coffee/espresso equation. I’d strongly recommend it for espresso lovers, who don’t want as much milk and froth as you find in a cappuccino nor in a Flat White, but who nevertheless want to taste their espresso blended nicely with hot milk. 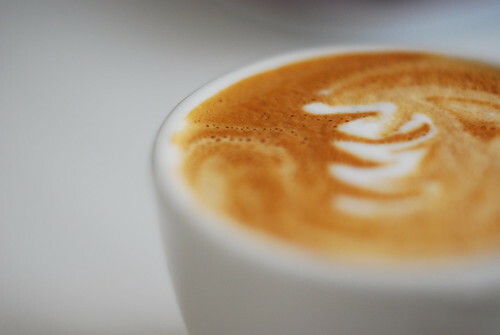 The other reason why I like a Cortado, is that I find it much easier to do latte art in a smaller cup – Well ! how else would I be able to share these nice pics with you because if I just talked and didn’t share these tasty pics to inspire you to try it at home, you’d skip my blog. 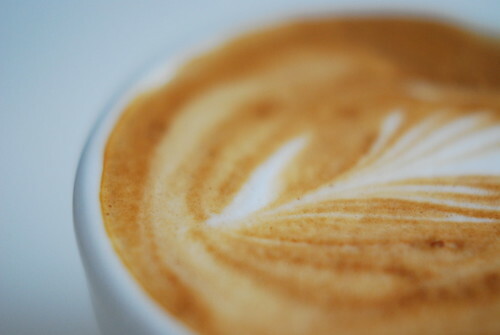 Coffee is about art and science – a wonderful blend of the subjects of our age – OK ! enough of this philosophical dribble, just try this at home. Ciao ! or perhaps on this occasion I should say Adios (for those who don’t know, this is the Spanish way of saying bye bye). Adios Cortado ! until tomorrow morning. This entry was posted on Wednesday, May 19th, 2010 at 10:25 pm	and tagged with Cortado, espresso and posted in Bean Talk - Coffees, Coffee Recipes, The Art of Coffee. You can follow any responses to this entry through the RSS 2.0 feed.